If you’re a long time reader of this blog, you know that I LOVE Cassandra Clare. She’s my favorite author of all time because I love the world building, characters, plot, writing style, everything about them all. And here’s the thing. Cassandra Clare’s books get better and better. I honestly think that each new book is better than the last. I think this is a testament to how talented she is as an author because I thought the first book she wrote was amazing. 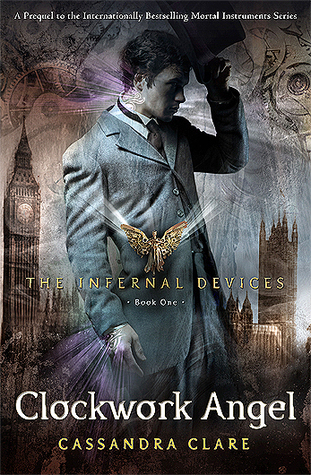 Anyway, I have a special place in my heart for The Infernal Devices series because: 1. Will Herondale is my ideal man, 2. London, 3. the best love triangle on planet earth. William Herondale. Let me tell ya. He’s sassy. He’s eloquent. He’s broken *in this book. * He loves Tessa. He loves Jem. He has a mysterious backstory. He’s handsome. The list could go on and on, but I love him. My favorite character from the whole series is torn between Will, or Julian from The Dark Artifices. Cassandra Clare just knows how to write great male characters. This book is set in Victorian London. Hello, yessssss. It’s my DREAM to go to London *IT’S HAPPENING THIS DECEMBER* so it’s amazing to see it even if it’s from another time. I love how the real places are woven in with fictional places. It’s just beautiful and amazing. This love triangle is just starting and I’M HERE FOR IT. I usually hate love triangles because my idea is this. If you fall in love with someone, but later fall in love with another person, pick the second person. You wouldn’t have fallen for them if you actually loved the first. But here’s the thing. Tessa doesn’t know that she loves both Will and Jem yet, or who she loves more, because she met them at the same time, and they’re so different from one another. I’ve ALWAYS been team Will from the first time I read this book because… I mean he’s a Herondale, and I’m usually here for them, but I also love Jem. I just don’t love Jem for myself, but he’s good for Tessa. It’s just so conflicting, so we’ll have to see how I react to it this time while I continue my rereading. I can’t begin to understand how Cassandra Clare weaves all of her stories together so seamlessly. The characters that carry over into the separate series just blows my mind. The ending of this book is such a cliffhanger even though I know what happens. Magnus is one of my favorite characters. He said something towards the beginning of the book that was to the extent of: “yeah I like boys with dark hair and blue eyes.” YEAH YOU DO. It’s just cute because everything has a connection. I love it.